Late one afternoon, we hopped on board a Green Line train at the Redondo Beach station and headed towards the city. Like the light rail in the East Coast cities where I have resided, the LA Metro system is a combination of above ground elevated track, ground-level track, and underground tunnels. 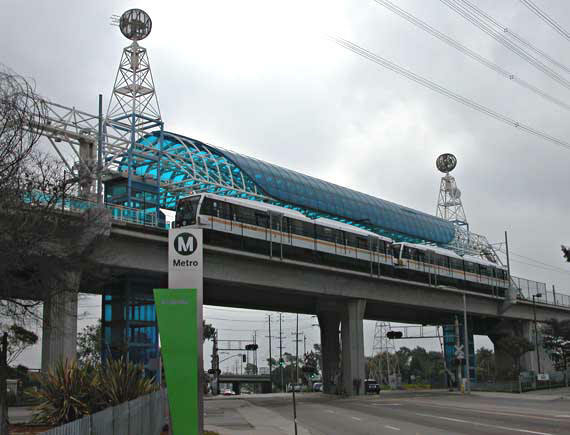 The Green Line runs primarily above ground on elevated track, eventually connecting to the 105 Freeway and running along the middle of the freeway between the two directions of travel. Sitting in the train cars and watching the scenery flash by offers a chance to appreciate parts of LA that are little more than background noise when driving by in a car. For instance, I doubt I would have never appreciated the sheer size of the Northrop Grumman facility that abuts the LA Air Force Base had I been driving by it, but to see this massive grey structure that bears more resemblance to something out of the recent Battlestar Galatica remake than a architectural structure. We arrived at the Willowbooks-Rosa Parks station in a bit more than half an hour and headed to the lower platform to await our transfer to the Blue Line that would take us right into Downtown LA. Located in the heart of South LA, this station has a number of interesting public art installations, which double as seating for people waiting on their trains. It was also here that I saw a rather surprisingly large number of commuter cyclists, a fact that makes me feel happy because it a sign of the continued growth of cycling as a part of the transportation infrastructure in LA. Our wait for the train was a longer one than expected, but when it eventually came we jumped on board and rode towards the city center. Unlike the Green Line, the Blue Line runs at street level, with stations located in the middle of the traffic lanes in the middle of the street. Seeing this part of LA from here makes one really appreciate the diversity that LA has to offer. All around us, people of all different races and all different backgrounds, jostling for every inch of space in the city's notorious traffic. Our fellow riders in the train - reading, conversing, listening to music - were a veritable tapestry of languages creating a multi-cultural din in the confines of the train car. As we approached downtown, the scenery changed and what had been small neighborhood shops gave way to massive towers of concrete, steel and glass. The Staples Center and adjoining Convention Center was little more than a silhouette against the brilliant pink and orange sky. Before much longer, the ground swallowed us up as we entered the very heart of downtown, arriving shortly thereafter at the final stop along the Blue Line. Exiting the station onto LA's streets, it felt good to be back in a city. There is a level of excitement and buzz that the suburbs simple cannot provide. After coffee with my wife's professor, we sought out dinner at the nearby Grand Central Market, a collection of artisanal food purveyors and farm fresh produce sellers located in the heart of the city. We wandered around the market for a bit, though most of the stalls had closed for the day already. The few remaining open ones did offer an interesting selection and shows just how much the food scene has grown here in the City of Angels. After a satisfying meal, we strolled slowly back towards Metro Center, coming across Angel's Flight and passing through Pershing Park among some of the more notable landmarks in the heart of LA. Urban living is one of those things that people either love or hate. Some people prefer the quiet of the suburbs while others crave the bustle. Downtown LA feels different in that the city center is largely commercial, with a population that disperses rather quickly after happy hour ends. It feels like a very different city than its East Coast equivalents, but continues to change as people seek lives that place them more in the middle of the action. It is a genuinely dynamic city that is evolving right before my eyes and I am pleased to be home to see the change take place.